Spring is creeping closer and closer - it's time for some serious Fashion! 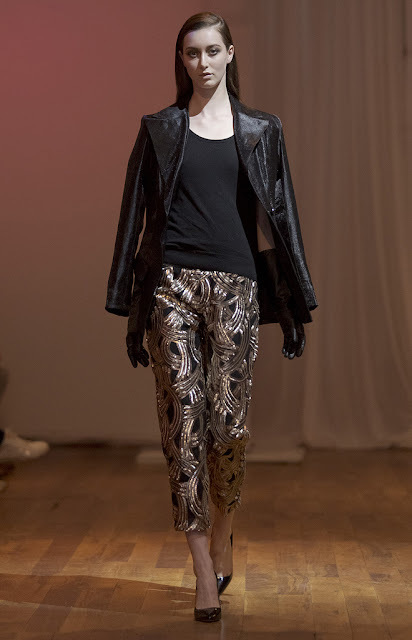 Just last week here in Toronto I had the privilege to attend the Runway debut of local designer Hilary MacMillian for her Fall 2013 Collection. Premiering at The Glassy Factory just off the Queen West strip, MacMillan boasted an aesthetic that played with glistening gold textures and damask opulence in wearable, urban forms. Creamy, off-whites and rich blacks were dotted with bright, blood reds and cool beiges (a perfectly balanced palette of what Fall neutrals should be) in classic pencils skirts, tailored 50's-era coats, and light-weight trenches. We absolutely loved seeing gold take centre stage as it beamed forward from all that neutrality; and especially the intricacy of the gold, patterned in finely detailed textural sequins in trim and even full-body forms; adding glamour, richness, and a glitzy, 80's touch to a generally clean-cut aesthetic. Accented with the lightest fabrics (what looked like it could've been soft Chiffon) and classic Fall textures like Fur and Leather; Hilary's showcase was strong, concise, and well executed. Congratulations on your Runway debut Hilary! Hope to see all you have to offer Toronto in the future.